Review of "The Heart of Trauma"
Many people experience traumatic experiences in their lives or need therapy to cope with tragic life events. The body's response to those experiences and memories can sometimes prevent the person from functioning in their daily life. Moreover, the distress caused by a traumatic event can put pressure on relationships and reduce job opportunities. Overall, it is paramount to overcome these feelings of distress to return to a quality of life prior to that traumatic event. 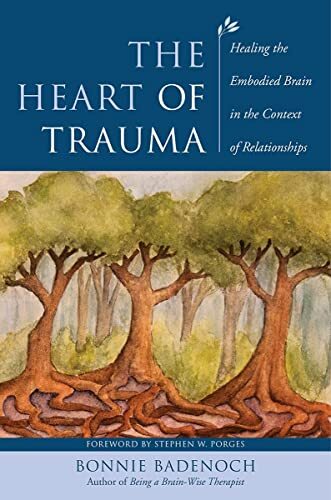 The Heart of Trauma: Healing the Embodied Brain in the Context of Relationships, by Bonnie Badenoch, describes the body's response to trauma and how the use of relationships can aid in therapeutic practices. Badenoch divides her book into two parts: anatomy of trauma and counseling. From the very first chapter she outlines what she is going to talk about and how she is going to do it. Her writing is very methodical and precise. She also approaches therapeutic practice from a holistic view examining the entire body including the physical and mental state of her patients. Each section discusses the importance of relationships within the therapeutic process and the role it plays in the healing process. In "Part I: Setting the Table," she specifically defines what trauma is and the nature in which we experience trauma. Moreover, she includes all the factors that influence a person's ability to experience and define trauma. Understanding how our body responds to trauma is critical to determine the type of therapeutic practice necessary to treat a patient. Badenoch describes in great detail what occurs in the body each time someone experiences a traumatic event. She explains how each anatomical feature is involved in responding to the stimulus of trauma. Badenoch continues to explain how the anatomical functions relate to therapy and how important it is to understand the bodily functions to better treat patients. However, her detailed explanations leave the reader lost at some points within the text. Unless the reader has background knowledge in anatomy, they are likely to struggle to understand the anatomical point of view presented. In "Part II: Nourishing Accompaniment," Badenoch describes the counseling aspect of treating patients that have experienced traumatic events. She uses examples and relates back to the anatomical functions previously described in part one. Repeatedly referring to different therapeutic techniques, Badenoch discuss the importance of open spaces and emphasizes the patient-practitioner relationship. Part II was written extremely well, but much like the first part, if the reader does not know much about counseling, it is much harder to relate to what the author is stating. However, section two was much easier to follow in terms of word usage. The book was written in a very straightforward manner. Moreover, Badenoch referenced many sources to refer back to if the reader wants to learn more about a briefly discussed topic. The book covers a lot of in-depth ideas and concepts concerning anatomy and counseling and is recommended for readers who have a background in anatomy and a social science. Overall, this book is compact with a lot of great therapeutic practices encompassing anatomical functions associated with trauma.